Montgolfiere by Dominique Erhard, Eurogames - Descartes, 1992/1999. Montgolfiere is a fast and simple board game that works well at parties. While it is not a deep and sublime strategy game, it is good as a social game for introducing people to the hobby or playing with younger gamers. It is also a good game to play as a warm up or a night cap at the end of the gaming night. Up to 6 people may play. Each player receives an identical deck of 24 cards. The board is a nicely-painted linear track with spaces numbered 1 to 15. Players place a wooden disk representing their balloon on space number 5. The goal is to reach the moon on the 15th space. If the cards run out, the highest balloon is the victor. After dealing 7 cards, all players play and reveal a single card simultaneously. After resolving movement, the card is discarded, and another is drawn to maintain 7 cards in hand. 15 of the cards depict a ballast bag and are numbered 1 to 15. The most basic move is to play a ballast bag. If all players reveal a ballast bag, the player with the highest number moves his or her balloon upward one space. If a number of players reveal the same number, the ballast number is increased by the number of colluding players. Thus 3 players playing a 10 ballast card are scored as a 13 (10 + 3) and will beat a single player showing a 12 or less. However, several other card types add spice to the basic play. First of all, an odd number of wind cards reverses the direction of travel. Thus, if one or 3 or 5 wind cards are revealed, the ballast war winner will travel one space downward. An even number of wind cards has no effect. Each player gets 2 wind cards. There is a single super motor card which allows a player to travel two spaces upward or one space upward in the event of foul weather. There are two types of card that allow you to interact with nearby players. The sleeping gas card cancels the card of all players who are one space below. This card effect is resolved before any other cards are considered, with the highest balloon resolved first. There are 2 sleeping gas cards. Finally, the grappling hook card allows you to follow the move of a balloon one space above. There are 4 grappling hook cards. The grappling hooks are cumulative, so some times long chains of balloons may all be pulled skyward. Because it is such a simple game, there is not much sophisticated strategy. Good play involves out guessing your opponents and counting and tracking cards. Of course, early in the game you never know when a wind card will be played, but if you count these cards, you may be able to make healthy guesses and influence your travel later in the game. Also, you may track higher number ballast cards and keep your high cards for later to ensure that you get the move. Once again, you never know when other players will play their wind. Use the optional Black Baron rule whenever you have fewer than 6 players and you want to add a bit of randomness to the game. The Black Baron's balloon is an automaton, propelled by random plays from the deck. To improve the Black Baron's play, useless card plays (such as playing a grappling hook when there are no balloons one level up, or playing sleeping gas when there are no balloons one level down) should be returned to the deck and redrawn. To illustrate the simplicity of the strategy in the game, we often find the Black Baron is close to the pack of human players, sometimes beating a few players. If a random player does this well, why agonize over your card selection? The flip side of the argument is that younger players never feel too far behind in this game, because excellent play is often confounded by the vagaries of the wind. 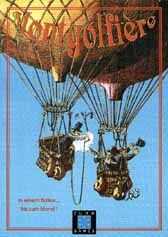 Originally release in 1992, Montgolfiere is now (1999) released in its second edition. The art is now crisper and uses more saturated colors. The illustration and graphic design of the game go to the game designer Dominique Erhard -- very good job. Other games by Dominique Erhard include Condottiere , Don Pepe , and Serenissima . Of these games, Mongolfiere has the lightest strategy and the quickest play. While there is not much thought or strategy in playing this game, it is a good game for laughs and socializing with more casual gamers. [an error occurred while processing this directive] Last modified: Thursday, 09-Jun-2011 12:36:54 MST.